One feature that I wanted to point out specifically is the integration of A2E into the ArcGIS Geoprocessing subsystem. Essentially, this will allow the A2E exporter to be called directly from scripts (Python, VBScript etc. ), Models, the CommandLine or directly from ArcToolbox. My favorite right now is the Model integration, there is just a myriad of geospatial analysis that be accomplished. Likewise, the time savings from the automation can be pretty significant. So now the final step can be to create a KML or KMZ file for consumption of the results directly in GE. I love this. You can perform analysis on your datasets and then send to users who don’t have ArcGIS. 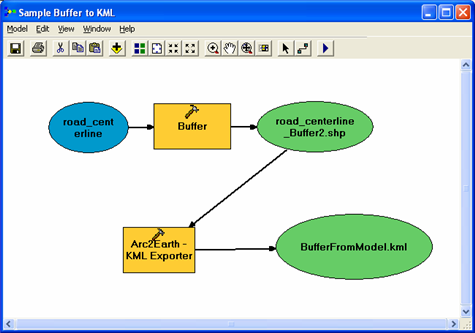 Export to KML becomes as easy as exporting to a e00 (well actually easier). I’ve written so many AMLs in my life that I even today continue to use AML (and Python) for scripting many of my analysis tasks. Rather than adding the output to ArcMap and generating a PDF to show others the results, I can just send them the KML and let them view it in Google Earth. Sweet!